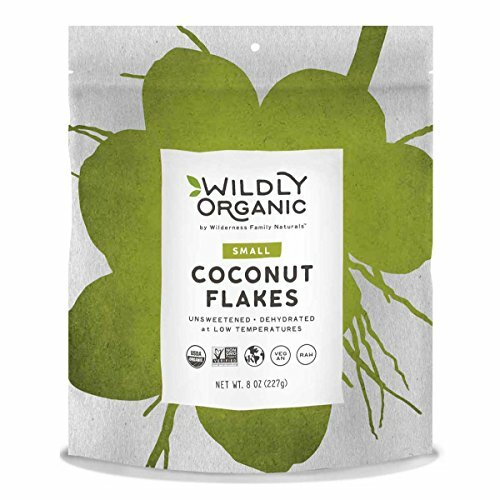 Wildly Organic by Wilderness Family Naturals' small coconut flakes are about the size of white rice. Many people find these will still work for macaroons, coatings and cookies (like a fine flake) and they also can be used in place of the large shreds. They are in-between those two flakes in size and can work in most recipes, especially if you want a more substantial coconut texture and flavor, but do not want too much chewiness. We worked for months to develop a natural, dried coconut that we could still call "raw." We are excited to finally offer a low temperature dehydrated coconut with a great taste. We start with wild coconuts. The coconut is removed from the shells, and washed in pure, filtered water (no chlorine is present). The coconut is then shredded and slowly dehydrated at 98.6°F (37°C). The result is shredded, raw coconut that tastes great, has a wonderful texture, and contains the nutrients found in coconut. Most shredded, dried coconut available online and in health food stores is actually desiccated coconut. Chlorinated water is used to clean and sterilize the coconuts once they are opened and peeled. The coconut meat is grated, often lightly pressed to remove some of the milk (moisture) and then it is dried in huge ovens at temperatures between 170°-180°F (76°-82°C). Coconut sold in grocery stores is made from this desiccated coconut by soaking it in corn syrup, propylene glycol and sodium metabisulfite to preserve it. There is a huge difference between raw dehydrated coconut and most store-bought sweetened coconut flakes. Our raw coconut flakes are great in trail mixes, numerous raw desserts, cookies, or great to snack all by themselves. This package contains 100% coconut flakes with nothing added. Small cut is about the size of white rice. Great for baking, macaroons, cookies, cakes, eating raw, and more! If you have any questions about this product by Wilderness Family Naturals, contact us by completing and submitting the form below. If you are looking for a specif part number, please include it with your message. Organic Coconut Chips-Unsweetened, Raw, All Natural, 25 Bulk bag.